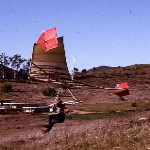 47 years ago today, on November 5th, 1971, I began construction of my Colver Skysail. The completed hang glider was first taken to a hill in January, 1972. ... always a hang gliding designer.